Two of my paintings sold at the Lake Oswego Festival of the Arts this year. The weather was ideal, and there were a lot of visitors strolling through the Open Show. My painting Cattle Grazing in the Columbia Gorge received an Honorable Mention, and it will be on display and available for purchase in the Lakewood Center Foyer Gallery from June 25 to September 5, 2018. After scrambling to get everything framed, strung with wire, priced, and labeled, we were generously given a full week to hang our work. We didn't need that much time, but it allowed us to wait until after a big rainstorm passed. All of my co-exhibitor's work was on watercolor or pastel paper, and we didn't want to risk getting them wet. Framing always takes longer than I think it will, although I get faster every time I do it. What surprised me most was how much time it took to get everything else prepared. Coming up with a title for each piece required some thought, and we had to decide what information we wanted on the labels. We would need a simple wall label with the title, artist name, medium, and price. We would also need labels on the back of the artwork that included more complete information, such as our website address, full contact information, where the work was painted (if applicable), date and copyright symbol, and details about the materials used. We use only 100% archival materials and methods. Because of the surprising number of non archival artist materials on the market, we felt it was a good idea to list this fact on the label. I also included information about the type of varnish I used, a useful bit of information in the event someone needs to clean one of my paintings in the future. Based on my research, pricing methods seem to fall into two main categories -- price by square inch and price per linear inch. Each has its advantages, but with square inch pricing (width x height), I end up with a bigger spread between the lowest and highest price. Since my smaller paintings were akin to daily paintings, and my bigger paintings had more detail and took relatively longer to paint, I thought this would be a good approach. The next big decision was what price multiplier to use. I decided to multiply the total square inches by $1, which ended up with pricing that was somewhat in line with those I've seen among intermediate artists in recent art shows I have attended. For example, my largest, a 20x30 inch framed painting, was priced at $600 using this model. My smallest 8x10 inch framed painting was $95. If I had gone with price per linear inch (width + height x multiplier of $10), those paintings would have been $500 and $180 respectively. I felt that would have caused my small paintings to be overpriced. This particular venue is not a well known destination for viewing or buying art. Most of the people who walk the halls are not in the market for buying original art. Being emerging artists, we don't have much of a following to draw likely buyers to the gallery. This was a poor test for my pricing method, but I plan to use it in the future to determine if I should raise or lower my $1 multiplier. The final element was actually hanging the work on the wall. The Commons Gallery is well lit with both natural and gallery lighting. It also has a professional hanging system from GalleryOne that was versatile and easy to use. Because of how the lighting bounced around, the paintings under glass had to be hung on one side of the Commons area. We put our two best and most striking paintings near the signage and pedestal where our artist statements, business cards, and guest book were placed. For good measure, we set up a second pedestal with business cards and set out bowls of candy to entice viewers to slow down and enjoy the paintings. It was March and the countdown had begun. In six months, my co-exhibitor and I would be hanging our artwork in the exhibit space at a local community college. We had seen the gallery space. In fact, we had seen the work of two other artists hanging up in that venue. I still wasn't exactly sure what I was going to paint for the exhibit. A week went by, and I was still combing through my library of reference photos looking for subjects to paint and debating about the best approach. Should I try to paint a unified series? Should I paint big, small? Should I paint on unframed gallery-wrapped canvas or flat panels I could frame easily? My indecision was due to a lack of experience with the options, and it wasn't helping me get started building a body of work. I decided to break with the general consensus that artwork in an exhibit should be framed as simply and uniformly as possible. Everything I read told me that it should be about the art, not the frame, but my justification for breaking this "rule" was a goal I had set at the beginning of the year to try many different substrates and framing options this year to find out what I liked best. As a result, I ended up using both 1.5" deep unframed gallery wrapped canvas and flat panels in black and brown wooden frames. That was not the only rule I ignored. Advice abounds that artwork should be presented as a series or with an overarching theme or style -- something to tie the work together. Because I work from my own reference photos, I had trouble finding enough photos with a common theme. What I did have was a number of very different subjects that inspired me. 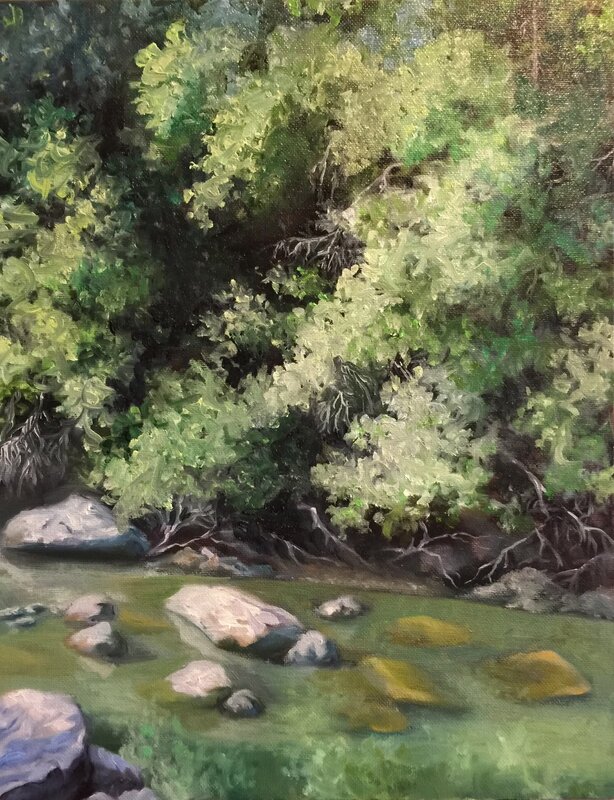 I decided to paint varied subjects -- landscapes, interiors, florals -- to figure out which subjects I enjoy painting. In hindsight, having consistency in my presentation and working within a theme would have greatly improved my exhibit. This is especially true because I was exhibiting with another artist whose work would naturally be quite different than my own -- a different medium, style, substrate, and framing. Our only consistency was inconsistency! In the end, I produced only seven paintings for the show, each one better than the last, but all different. For many reasons, I would have preferred to wait until I possessed a body of work before committing to an exhibit, but that might have meant missing out on this great opportunity to learn what exhibiting entails and discovering what I am capable of when I push myself. You Have a Venue...What Now? As soon as I confirmed the Clackamas Community College in Wilsonville was interested in having me and my friend submit images of our artwork for consideration, my next concern was figuring out what would be expected of us. Fortunately, although this exhibit space was fairly new, they had their act together. The facilities director was organized and provided paperwork with detailed information about what we would need to submit for consideration, what the agreement entailed, and what to expect if selected to exhibit. 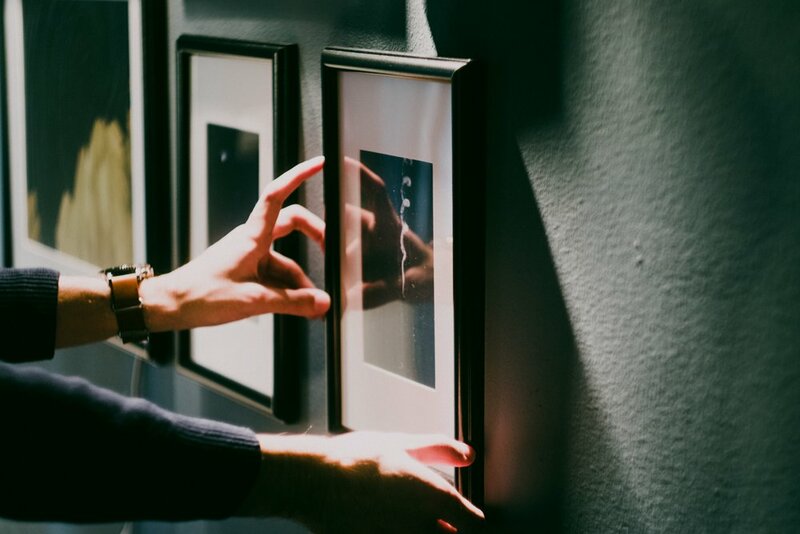 The Exhibition Loan Agreement listed important dates, such as the exhibit start and end, delivery and installation, opening reception, and de-installation. There was a section for contact information and a description of all artwork to be hung. It also had a section with terms and conditions, as well as insurance value. If we opted to list insurance value, we would have to provide proof of insurance. The venue was in the commons area, which was monitored by college personnel, so we opted not to have insurance. We did not have to submit the agreement until just before we started hanging our work in early September, but having it at the outset let us know what we were signing up for. Separately, I received information about the signage, hanging hardware requirements, and how the college would handle announcements and news coverage. I was impressed that the college arranged for a lengthy announcement to appear in the Boones Ferry Messenger and an interview with the Wilsonville Spokesman that resulted in a full-page article about the exhibit. The college provided a handy checklist of things my co-exhibitor and I would need to submit right away, including a resume, artist bio/statement, press materials (used as a background for signage and announcements), and digital images for the college website. We also gave the director links to our websites so she could see plenty of examples of our work. My co-exhibitor and I went right to work polishing our artist statements and doing an inventory of existing paintings. The exhibit would start on September 19, so we had about six months to prepare. We put together a timeline to track important due dates and we estimated 20-30 paintings would be needed to fill the space. The tough thing for me was figuring out how many paintings I could produce in six months. My goal was to complete 15 sizable paintings, and I didn't have much of a head start. The few existing paintings I had were little more than studies. Working in a new medium (oil) made it hard to predict how productive I could be. This was by far the most nerve-wracking aspect of committing to this exhibit. We provided the director with all of the submission paperwork and received a rapid response letting us know we were accepted. Let the games begin! Do they cater to emerging artists? Will the exhibit get much foot traffic? Are the people walking by likely to purchase art? How do they market the event? How long will the art hang on the wall? How much work would I have to produce? Do they charge a fee or commission? What is the process for being considered and selected? I discovered that visiting the space in person is important. I can tell right away if my art is a good fit and whether the space has good lighting, good signage, and good placement to grab attention. It also tells me if there are potential issues, such as glare for works under glass, precarious art hanging systems, or an inability for viewers to see work both up close and at a distance. Opinions vary widely about whether venues like this are a good place to sell art, so I asked a range of artists about their experiences. Some tried it a few times and quit after no sales were made, but a few have been able to sell at least few paintings each month this way. So why were they successful? Keeping the art affordable (typically under $100) is a big part of it. Instead of big paintings in expensive frames, they often choose smaller or unframed works, daily paintings, or plein air studies to help keep prices low. Unlike arts shows and festivals that charge hefty entry fees and big commissions, these venues typically ask for little in return, making profit margins higher. The other key element is making sure the style and subject matter are a good fit for both the space and the clientele. No one goes to these venues with a mind to buy art; they buy on impulse. So what will catch their eye? Don't be afraid to ask the proprietor how often someone buys a piece of art and what seems to be working best in terms of price range, size, style, and subject. There are many nonprofit companies, health organizations, churches, and charities that promote the arts to build awareness and raise funds for special programs. As an example, I will be submitting my work to a local cancer care center in November to be considered for an exhibit in early 2018. They require a minimum donation of $50 if the work sells, but there are no other costs to exhibit. The space is beautiful with lots of foot traffic and willing buyers. Only a handful of artists participate over a two-month period, and only one piece is allowed per artist. This is ideal for me because I don't have to create more than one painting, but I still get to list the experience on my resume. With a limited number of paintings hanging there at one time, my work is more likely to be noticed and hopefully purchased. Even if it doesn't sell, I can at least hope to acquire new followers. Plus, I like the idea that I am supporting a good cause. Are You Ready to Exhibit Your Art? Exactly how does an emerging artist know when it is time to find a public venue to display his or her art? I suspect that the answer for many new artists is "Not yet!" Had I not stumbled upon my first opportunity to exhibit, I wonder how long it would have taken before I mustered the courage to seek it out. Because my first exhibit opportunity fell into my lap, I was forced to make a quick decision: do it now or do it "someday." In the end, I chose now -- the uncomfortable, scary option. I did not to wait until I felt ready, and this blog series will explain why you shouldn't either. You see, although I have sold a handful of paintings in non-juried art shows over the past few years, I can't say that I've produced more than a couple dozen paintings over the past decade. Preparing a body of work for this exhibit would require a huge increase in productivity. Plus, I made the switch from watercolor to oil this year, so I had to ask myself, "Would my oil paintings be any good? Would I be able to finish enough paintings in time?" My confident side told me not to worry. After all, I have a track record of showing and selling my art in public, right? My insecure side reminded me that I had only sold a handful of paintings, and that could hardly be called a track record. It was unnerving knowing I would be starting at zero in terms of a body of work, not to mention painting in an unfamiliar medium. So why on earth would I consider committing to a big exhibit at this time? For me, asking myself if I was ready was the wrong question. It was really about saying yes to those four questions. As soon as I did, it became much easier to take the risk and step into the unknown. I admit that it helped having a friend and fellow artist as a co-exhibitor (it was also her first time exhibiting). Between the two of us, we were able to fill the large space and meet all of the exhibit deadlines. Are there things I'd do differently? Sure. Am I satisfied with the result? Yes. My friend and I learned much along the way, and hopefully our experience will encourage you to seek your first exhibit, too, even if you don't feel ready. What is it really like to participate in your first art exhibit? I didn't think I would need to ask that question at this early stage of my career, but the opportunity arose, and I decided to jump in with both feet. As soon as I committed to it, I started doing my research. I found plenty of general advice, but not the specifics I was hoping for. My very first exhibit opens today -- a joint exhibit with fellow artist JF Warren. I decided to write about my experience as a first-time exhibitor from start to finish so other emerging artists can get a sense of what it is like. You got a Venue...What Now? I recently joined a wonderful group of Portland Area artists called Alla Prima Portland. They meet each Thursday morning at O'Connors in Multnomah Village just down the road from me. The people are friendly, knowledgeable, and most importantly, fun! I love the format of the meetings. They start with a discussion of a specific preselected topic, which is followed by a show and tell of paintings by the artists in attendance, and they wrap up with an exchange of news about upcoming shows, exhibit opportunities, paint outs, and workshops. They also post minutes of each meeting and images of the artwork shared during the session. These books were recommended by one of the artists. I may have to take a trip to Powell's Books and add them to my library! I recently rounded out my new plein air kit with a very sturdy Alta Pro tripod from Vanguard that can handle this extra large Yellowstone pochade box from Alla Prima. I also added a fabric tool bag that hangs from the center post. It serves as an anchor weight and has lots of compartments for storing art supplies (and snacks) up off the ground. With my kit complete, a fellow artist friend and I struck out last weekend on what was to be my first plein air painting adventure. We chose a spot in George Rogers Park in Lake Oswego along a small inlet just off the trail. In addition to a couple of great blue heron, we saw a turtle, an osprey, a duck with ducklings, a killdeer, and even a curious turkey vulture that perched in a tree above us for a while. We painted in that spot over two evenings, but I ended up having to finish it up in the studio. Having the right equipment really helped, especially since I am painting in oil. After this experience, I plan to do a lot more painting outdoors this summer. Despite a heatwave that drove down attendance, I was very happy to have sold the single piece I entered in the Open Show at the Lake Oswego Festival of the Arts this year. I chose this floral subject because of its vibrancy and the stark contrast between the intense yellow petals and the dark wet leaves. I switched from watercolor to oil this past year and was able to complete this painting Yellow Rhododendron just in time for the show. I am now focused on producing paintings for an upcoming art exhibit and a small show this fall. It will be a challenge, because I am still getting used to working in this new medium, but I am enjoying it immensely. This painting of a barn on the historic Antietam Battlefield was purchased by a woman from Maryland who recognized the barn. It goes to show, you never know who will connect with your art at an event like this. The Open Show at the Festival allows me to show my work to thousands of potential buyers at one time, which is a great test of whether there is a market for my art. I also compare my work to other artists and pay close attention to which paintings sell and for how much. Does my work stand out? Are my prices appropriate? What are other successful artists doing that I am not? An event this size is a great way to find answers to those questions.